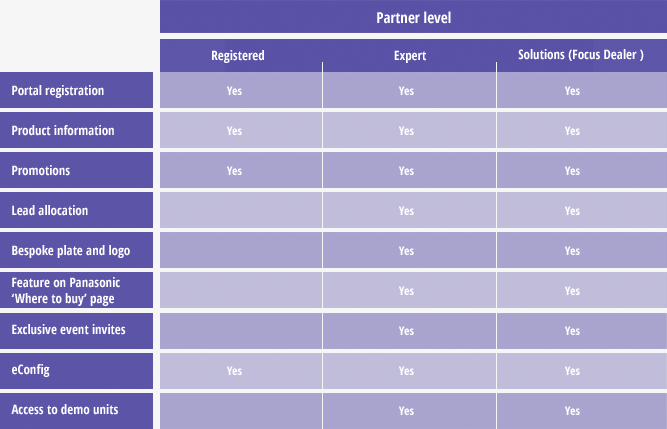 Although the Partner Programme focuses on each of our B2B product ranges, there are specific benefits for Communications Solutions Partners. You have access to a full product library, offering instant answers to any question relating to products or features. You can also search and download marketing and technical files (pictures, specifications, manuals, firmware, training, etc.) as well as general case studies. Stay informed of the latest promotions and receive exclusive incentives designed for your partner level. You can access these promotions via the Panasonic B2B Partner Portal and set up your own dashboard to monitor the status of your requests. We receive a large number of end-user leads requesting a solution or a specific product daily. With lead allocation, you receive these requests, helping you grow your business easily. Leads are prequalified by our telemarking agents and can be allocated to you exclusively or sent to a group of partners on a first-come, first-served basis. Use your logo to be recognised as a Panasonic Partner. You can download your plaque, as well as your logo, directly from the portal. Delivered either face-to-face or online, our training programmes have two significant benefits. Firstly, they allow you to offer customers more in-depth advice when selecting technology. Secondly, progress through the training is directly connected to your ascending level of partnership. With over 2,000 visitors per day searching for resellers on our websites, they are among the most visited in our industry. 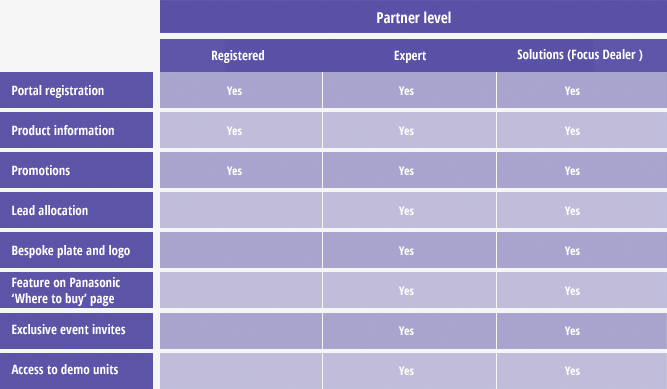 Panasonic ‘Where to buy’ pages display a list of partners with their membership level. This gives you an incredible opportunity to promote yourself as a specialised partner. Find out quickly whenever new events or training sessions have been organised for you. Often, these events may be exclusively for your partner level. PBX eConfig on line tool allows you to create and store projects details. Enter customer requirements, compare proposals in a glance and download your selection in order to easily build your personalised offer. Full Rules and criteria are described in Terms and Conditions available in the Registration process.